Don’t underestimate the value of doing nothing. 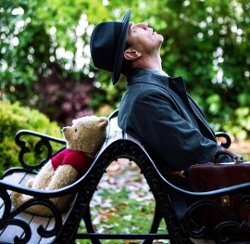 As an adult, Christopher Robin is stuck in a rut and focused on his new life, work, and family. One day, he suddenly meets his old friend Winnie the Pooh, who helps him to rediscover the joys of life. Adventure, Animated, Comedy, Drama, Family, Fantasy. Violence Infrequent impact isolated realistic, but mainly unrealistic violence, not resulting in injuries or blood-letting. 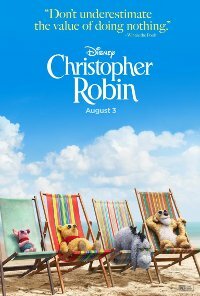 Comments The animated adventure comedy Christopher Robin explores positive themes of family, friendship, childhood innocence, responsibility, parenthood, loyalty, fantasy and happiness, balanced with more complex and mature themes dealing with strained family relationships, reconnecting with one&apos;s inner child, and the impact of work pressure on one&apos;s family life and happiness. The more complex and mature themes may be confusing to young children under 7 years. Themes are also presented with a sense of threat and menace as contained in the themes of strained family relationships, presented through arguments between Evelyn and Christopher, Madeline&apos;s unhappiness and Christopher&apos;s demands of his daughter, which may be upsetting and distressing to younger children. Although the story is fantastical and unrealistic, featuring talking animals, the animation and some of the themes are presented realistically, and young children may not be able to differentiate between fantastic and realistic elements, therefore not benefiting from the mitigating impact of fantasy. Positive messages dealing with the importance of taking time for oneself, remaining present, reconnecting with one&apos;s inner child to facilitate happiness, the importance of prioritising family over work and a positive attitude, may also be better comprehended by children over 7 years who are more cognitively mature. Parental guidance is recommended for children of 7 to 9 years to help explain the context and to provide comfort and reassurance if needed.